New pictures - smaller but better! The right side up close. It's quite pleasant! I made this blanket for my aunts' Christmas present. I actually tiled the blanket, but it ended up taking really long to sew, so this is my amended version, and I hope it works. Please change this pattern to see fit to how you like it. 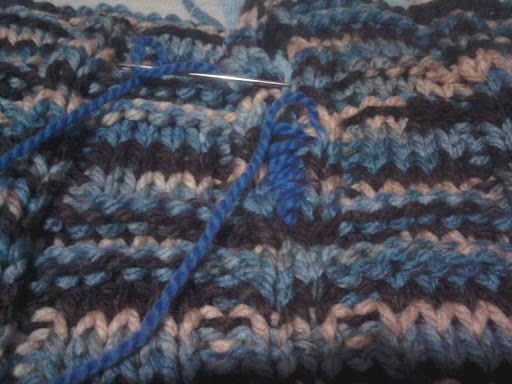 Always knit a swatch and block it before going ahead of this project, because it uses a lot of yarn. &nbsp;This is not a double knit! It requires knitting back and forth on the loom. I took the pattern from knitting on the net squares in squares stitch. I tried to mimic the pattern in 3x3 squares in squares. I would say this is an intermediate pattern, but it really isn't. It's just that it is a tedious pattern and you need to be committed to it to finish it; the hours are long, but you have something very warm at the end. You also must be comfortable at purling stitches, and you will need to block each panel. You can also mark your progress on this project on Ravelry. 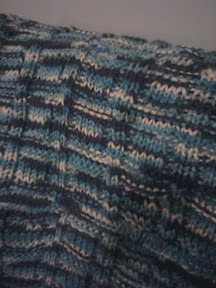 Cast on using any sturdy cast-on (do not use e-wrap knit over cast-on) on 32 pegs. Row 3 and 4: &nbsp;Knit 2, *purl 8, knit 2, repeat from *. Row 5 to 10: Knit 2, *purl 2, knit 4, purl 2, knit 2, repeat from *. Row 11 and 12: Knit 2, *purl 8, knit 2. 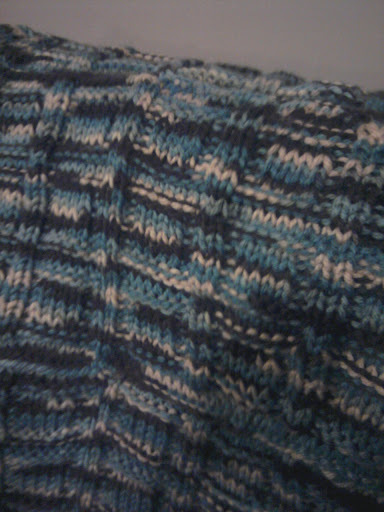 Row 13 and 14: Knit. Row 15 and 16: Purl. Repeat pattern (Row 1 to 16) 3 more times, and then repeat the pattern from row 1 to 14 once. In total you should have 5 "tiles" of the square repeats. This is one panel. Make 3 of these panels altogether, block them, and sew them together. Sewing - I used the mattress stitch - which means that you will notice the seam on the wrong side - it's not that bad looking, but you can also think about slipping the side stitch when you start the next row and sewing it in a different manner. Do not be scared of trying it out (though I would recommend you making 2 small samples of the pattern and then sewing them together). I avoided sewing like the plague, but this is easy, straightforward and fun! It may require for you to look at more than one website - to complete the picture in your mind on how to do it. http://www.dummies.com/how-to/content/how-to-join-knitted-pieces-with-the-mattress-stitc.html - This is the dummies version that gives you a drawn diagram on how to do the mattress stitch - I like how it is drawn - it is neat. You can clearly see how to start sewing, but it is hard to see the "ladders" you use because the picture does not show depth. http://www.knitty.com/ISSUEspring04/mattress.html - Knitty has a great tutorial (and they are located in Toronto!!) on how to do the mattress stitch for different seams. 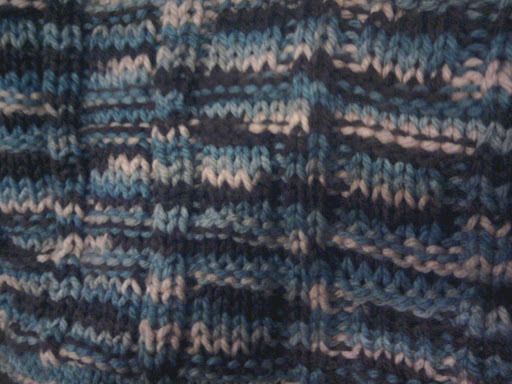 Of course, this project is just seaming the stockinette stitch. This is possibly my favourite instructional webpage for the mattress stitch. You can see how you you have to pull your stitches apart a little to find the running ladder. They also have some good tips that other pages may not talk about. 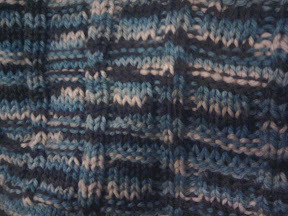 http://www.knittingdaily.com/blogs/howto/archive/2009/04/10/mattress-stitch-tutorial-vertical-seams.aspx - I don't really like the tutorial as much, because it is hard to see where the running ladders are - but (! sorry for the exlamation marks by the way) they have a good picture of how your the seam looks on the wrong side of your knit. This is so you won't be surprised at how it looks like. 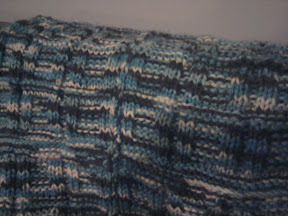 Blocking - Acrylic requires heat to block. If you don't block this big project, it will be all wavy - the easiest way is to throw your project in the dryer since this project is pretty big. http://rainyknits.blogspot.ca/2006/08/blocking-acrylic.html - no pictures, but this tells you how to lay out your for blocking and what kinds of things to use (an iron) to block. I found this more informative than the other articles, because the other posts were smaller projects. Have fun, and if you have any questions, please ask! I must remind you this is a very time consuming project, and that patience is very important (to finish this project). It took me 8 days to make. This was also because I knit in squares, and then had to learn how to sew them together (which I regret a bit - I messed up a billion times). The wrong side also looks really nice! My sister liked the wrong side more. 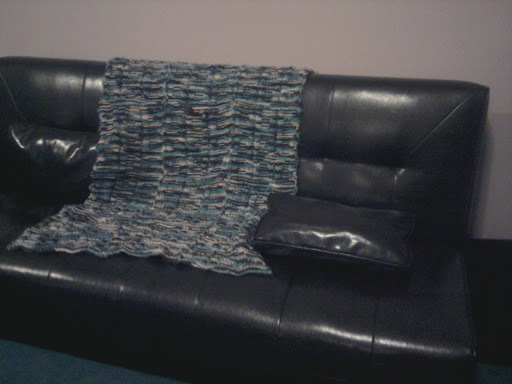 I only have big looms, so I had to nix the idea of making everything using a loom, since chunky knits can use up a lot of yarn. Don't judge. I gave away 29 presents to my family members this year, although most of them were not knitted products! I am not even including acquaintances here. I messed up the purple cast off (which I later fixed). The difference in size is because one baby is older than the other. I'm sure you can make something similar on the loom, but the stitches would be bigger. I did use a loom! I made a tiled blanket of a squares pattern for my aunts. Unfortunately, I should have thought ahead and made 3 long panels. I ended up making 15 squares for the blanket and sewing them together. I actually like sewing...but the weaving in the ends was the most annoying part. 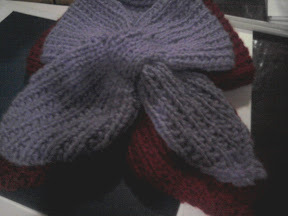 I'll probably post a pattern later in the week. Acrylic is a pain to block, and I unfortunately finished the blanket too late to be able to throw it in the washer and dryer...so hopefully they'll do that to straighten it out. Some other news: I will be having a minimum post a month. They may not be tutorials or anything...but possibly even projects I did, because those posts take up less time. Fingers crossed that I will be able to do my schoolwork and post and volunteer. I also apologize for the photos taken from my cell. I totally regret that.